A Muslim Child is Born: Ramadan Activity Book for Kids! Alhamdulillaah, here is the Ramadan Activity Book. It is hoped that this book will assist parents in teaching their children about his Blessed Month. just wanted to say "salamualaikum", very glad this book is out.. i like all your materialand use them for our children´s projects and Kindergarten.. Yazakiallahu khair! I look forward to doing these activities with the little ones. Mashallah Tabarakallah the activity book is very cute, creative and beneficial Mashallah! Jazakallaho khairun for all the inspirations you give through your blogMay Allah grant you great rewards for all the efforts you make in His way Ameen. MashaAllah, such a great work you have done there, may Allah swt reward you abundantly in this life and the next, ameen!! Keep up the good work, sis!! I do follow your web blog and I'm so recommending this activity book on the forum..
May Allah swt grant you and your family and all of us a blessed Ramadan!! Jazzakillahu khair ukhti! I am so greatfull for all the work you have put in Baraka'Allaahu'Feekum! You have saved me so much time:) I will keep you and your family in my duahs during Ramadhaan insha Allah. BarakAllaahu Feeki ukhtee. I was just wondering is there is a black and white version of this pdf. Wonderful! May Allah reward your for your hard work. MashaAllah, this is wonderful. We will use most of the worksheets during the Ramadan for sure inshaAllah. May Allah reward you abundantly. masha'allah! What a fantastic little book! Umm Maryam, dear sis, which version of the book are you having difficulty with? I will put the links here for you to make it easy insha'Allaah *smile*. But if you can please tell me which link you were having difficulty with so that I may check it insha'Allaah. Jazaakunnaallaah khayr for all of your kind comments. Truly, All of the Praise is due to Allaah Alone. After that I will say what dear sis Umm Suhailah has reminded me with these last few days, barak Allaahu feha. It is what our dear Sheikh Al-Albani (rahimullaah) mentioned that Abu Bakr (radiallaahu anhu) said and it is: May Allaah make me better than what they think, forgive me for what they do not know, and do not hold me accountable for what they say. And also Ibnu Qiyam said that Ibnu Taymiyyah (rahimullaah) used to say that I am nothing and nothing (good) comes from me. Again, all of the Praise and Thanks are due to Allaah Alone and may Allaah reward you all for your kindness. And dear sis Ummi Subhana, I wish to make sure I understand correctly. Is the book not at the level of your child? If so, please email me the approximate age of your child and we can see what can be done biithnillaah. I just tried the links sis all links are ok while previewing but when you click to download it says 403 Forbidden. So something wrong somewhere I guess. I was able to download before! Maybe something wrong with Box.net today? Allaahu a'lam. Tayyib, I will move all of these files to Google docs to...maybe that will help insha'Allaah. I was able to access the link. But, whenever i click on the icon "download", I receive the error message saying "forbidden 403", alhamdulillaahi `alaa kulli haal. I even tried signing up for an account on Box.net but it avails nothing, alhamdulillaahi `alaa kulli haal. please forgive me sis for troubling you. I hope i can access your materials in shaa' Allaah.Baarak Allaahu feeki. Dear sis, you are not troubling me at all, rather I apologize that you have had this trouble. Please see the first (newest) post on the blog where I have explained that I relinked them using Google docs and you should have no problem downloading them insha'Allaah. 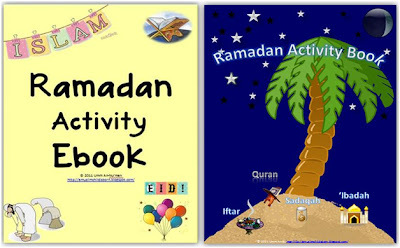 In the Ramadan Activity Book post you will see that it now says, "Download Through Google Docs" and files underneath this title. Please use these links until the box.net issue has been resolved insha'Allaah. I again apologize for the inconvenience you have experienced and jazakillaahu khayr for your patience. I just discovered your blog and MAshAllah it is amazing! I can't wait till my child is a little bit older to start using all of these materials! I am sooo excited! May Allah reward you IMMENSELY for all of your hard work! @ Umm Abdarrahman: dear sis, no unfortunately, there is no black and white version. I think you can set your printer to print it in black and white though...Allaahu a'lam. @ Maddyy: jazakillaahu khayr dear sis. Sis, there are activities on the blog from birth if that will help. If there is something specific that you are needing please let me know and insha'Allaah, after Ramadan, I can design something for your child *smile*. Jazakillaahu khayr. mashaallaah this is wonderful! jazaakillaah khair 4 sharing. sorry to bother you sis but i think there is a mistake on page66 with the letter spelling of TEN?? the letters to choose from are THE. wa iyaki wa jazakiallaahu khayr for pointing that out...you are absolutely right *smile*. The correction will be made insha'Allaah. jazakillaahu khayr for your kind words dear sis Fatma. Indeed, all of the Praise is for Allaah Alone and all of the good is from Him. Insha'Allaah, you are having a blessed Ramadan. alhamdulillah, thanks for your kindness the ebook is very useful. Still having problems with this. I don't see a link that redirects to google docs. Anyone else? There have been no other reported problems. Please let us know if after trying the link above, you are still not able to download the book. The books are not available through Google docs. They are available through Box.net. comment faire pour ouvrir ce fichier svp en francais? Nous sommes désolés pour la réponse tardive. Ce fichier n'est pas en plusieurs langues. Si vous téléchargez le livre d'activités à partir de ce lien https://app.box.com/s/m713666spnx9bbuwyj9a, il n'a pas de texte de sorte que vous pouvez imprimer et écrire à la main les instructions dans la langue de votre choix. Asalaamu'alaykum jazaakillaahu khayr for sharing mashallaah this is fantastic. Please can u check breaking fast dua. Not sure if harakaat in right places for beginning words? Syukron for the great book yaa ukhti..
Assalamu alaikum wa Rahmathullahi wa Barakathuhu,dear sister.May Allah accept your striving,preserve your creativity and increase you in excellence.Aameen.I'm sure I'm talking for all the grateful moms to who you have gifted you efforts.BarakAllahu Feek. Waalaikum assalam wa rahmatullaahi wa barakatuh. Subhana'Allaah...my dear sister in Islaam, what do I say to such a beautiful du'a except jazakillaahu khayr and all of the good is from Allah Alone. Wa feki barakallaah. May Allaah reward you generously. Ameen. Assalamu alaikum wa Rahmathullahi wa Barakathuhu,Such a great effort.May Allah reward your striving,preserve your creativity and increase you in excellence.Aameen.For providing moms with what they would like to do for their kids but are unable to,BarakAllahu Feek. Again, dear sis Murshidah, may Allaah reward you for taking time to leave such a kind, thoughtful comment and dua. Also, alhamdulillaah, Allaah rewards for the good intentions so may Allaah reward the mothers who would like to do for their children but for whatever reason that Allaah has decreed and written, they are unable to. And may Allaah always place sisters on the earth who can assist the mothers in accomplishing their Islaamic parenting and education goals. Ameen. I live the Ramadan activity book and inshallh i will be using it. I just wanted to bring something to your attention. In the Arabic version of the book i found a mistake in the number boxes. Where the child has to put the correct number of dates in the opposing box. The boxes that have the numbers 3&4 have the incorrect number of dates. Jazakillaahu khayr, dear sis Noha, for bringing this to my attention! The correction will be made and the book will be updated in this post in shaa' Allaah. You are most welcome, dear sis! Sis Naeema, the links have been repaired. You should be able to download the book now insha'Allaah. Please let me know if you still cannot access the book. Jazakillaahu khayr. I am unable to download the English Book of Ramadan activities, please email it to me. The links have been repaired alhamdulillaah. You should be able to download the books from within the post now insha'Allaah. Please let me know if you are still not able to access the book. Jazakillaahu khayra. Mashaallah, wonderful work..I would love to share this with others may Allah reward you with bountiful amount of His Love and Mercy..
Wonderful2 effort mashaallah..may Allah reward you with abundance of love and Mercy and Grant you Jannah! Please allow me to share this to my kindergarten teachers and my friends..
Inshaallah this will benefit a lot of children,parents and educators in learning n teaching about Ramadhan ! May Allah bless you dear Umm Nu'man..
Assalamualaikum Umm.. I have trouble in downloading this. I have tried many times. First, using ecosia, then Firefox,chrome. I also Made account in BOX on order to get this but its still failed. What should i do? I am unable to download the English Book of Ramadan activities. Could you pls repair the links. Jazakillah khair.